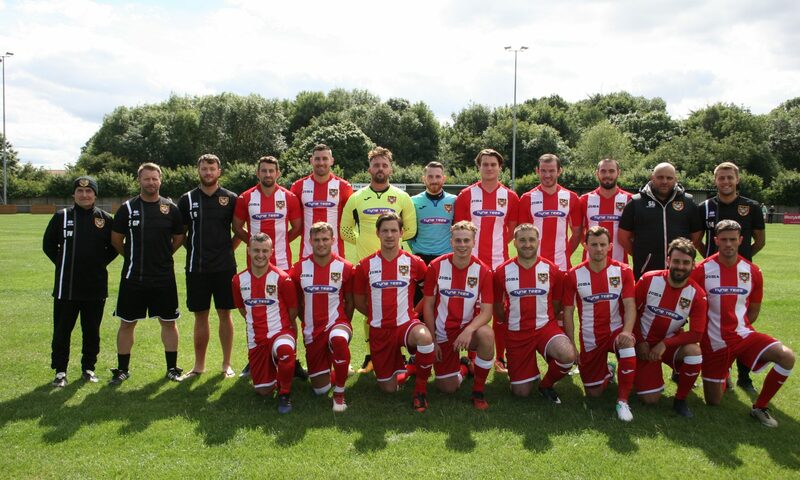 Ryhope missed out on a chance to leapfrog their opponents today as two first-half goals were enough to seal the win for Newcastle Benfield. Two disallowed goals and the metalwork denied Ryhope taking anything from Sam Smith’s Park. Welfare welcomed back Lewis King, who was injured during the warmup against Stockton meaning Robbie Bird was starting from the bench. In what was a slow burner of a game, the only interesting fact from the opening five minutes was the lengthy discussion between the referee and home dugout on how many match balls should be available. The referee’s influence on the game would not end there. The first meaningful attempt on goal came on six minutes. Ollie Hotchkiss delivered a curling freekick into the box, with Benfield unable to clear Jack Devlin took the opportunity to shoot, only for it to deflect into the Keeper’s hands. Andrew Granger was then able to deliver a long throw down to Paul Brayson. Beating his man, Brayson delivered a cross into the heart of the Ryhope defence, eventually falling to James Martin only for him to hit a tame shot at Joe Atkinson. Three minutes later Benfield took the lead. Good play down the left from Brayson gave himself room to cross in the box where Mark Turnbull was able to get to the ball ahead of anyone and bundle it home. Ryhope could have been back in it shortly after. A nice interchange in the box between James Ellis and Christopher Trewick allowed for Ellis to cross into Jack Devlin, standing unmarked on the edge of the six-yard box. His swinging shot missed the ball completely and Benfield was able to clear. This was not the first chance of the half or even the game to fall at the feet of Jack Devlin. It was just one of them days as he missed several good opportunities to get Ryhope level. On another day he would be taking the match ball home with at least a hat-trick. Ryhope were looking the better team mounting pressure on the Benfield goal with Danni Lay and Ben Riding able to deal with everything thrown at them. Ryhope were rewarded for there efforts on 28 minutes. A sloppy clearance at the back gave Ellis a shooting chance from outside the box. Granger in the goal was equal to it and pushed it past his post. From the resulting corner, Devlin had his shot parried. When Riding was able to keep the ball alive Ellis took aim and finished low. But it wasn’t Ryhope’s day. And two minutes later Benfield was back in the lead. A second of two corners for the home team found Atkinson in coming to claim, with the ball over his reach, Brayson was on hand to head the ball in the back of the net. Now Benfield was really applying pressure. Lewis King blocking a corner at the near post and Brayson coming close again, only to stand on the ball in the six-yard box when shooting. On 38 minutes came the next controversial moment involving the referee. Danni Lay, when shielding the ball caught James Martin in the face with his arm. The Benfield player went down easy. After several protests by Benfield players, he eventually awarded a freekick, booking Lay. This would mean Lay misses the remainder of the season due to suspension. Just before the break Benfield almost added to their lead. Ben Riding had been ordered off the pitch having been clattered by the Benfield keeper. He was refused requests to enter the field of play again when Benfield broke forward from the back. Martin broke in the box and but couldn’t get the ball over the line and Atkinson was able to gather at his feet. It didn’t take long for the first talking point in the second half. After only three minutes Ryhope thought they were back in the game through Ellis. Hotchkiss delivered from the right. Defender and keeper collided leaving Ellis to loop the ball into the goal. But it was ruled offside by the officials stating Devlin on the line moved the ball as it crossed the line. Further chances fell the Way of Ryhope. Devlin hitting the top of the crossbar with a shot from distance, Lay couldn’t quite climb high enough to meet a Hotchkiss cross, substitute Robbie Bird hitting the frame of the goal from distance. There were strong appeals for a Ryhope penalty when Ben Riding was bundled to the ground from a corner. But nothing was quite going Ryhope’s way. Devlin had another chance to bring the two sides level with twelve minutes on the clock. A cross from the right couldn’t be gathered by the Keeper. Devlin latched onto the loose ball only to have his shot to the empty net charged down at the last moment. Robbie Bird was again frustrated by the frame of the goal on 86 minutes. He picked up a loose ball in the 18-yard box. Beat one and shot only for it to cannon of the post. As the game crept into added on time, Ryhope had the ball in the back of the net for the third time. Deviln was able to expertly control and bring down a long clearance from the back. With his second touch, he fed Ellis through on goal. Ellis brought the ball back across himself and could have easily gone down under the challenge. He was able to poke the ball between the keeper and a defender for Melvin to put the ball in the empty net. Then came heartbreak for Ryhope as the goal was disallowed. After the game, the referee advised it was because of a foul on the keeper. Looking at the footage, there was no foul. That would leave Ryhope with only their second defeat of 2019. Speaking after the game Assistant Manager expressed his frustration at the result.